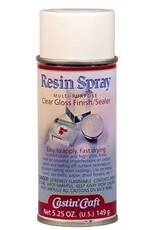 Resin Spray, is a fast drying, clear gloss finish/sealer. Ideal for fixing small blemishes in cured resin pieces. It adds luster and shine to resin pieces created in a mold that may appear dull when removed. Its best to apply several light coats for most applications. Resin Spray is ideal for sealing paints, inks, gel markers, metallic pastes, paper, fabric, dried flowers and other items you wish to embed in resin. Its works great to clean up cast resin pieces which may have been lightly sanded and its a fabulous top coat for polymer clay projects.